Air Bags – There are eight air bags provided internally which offer protection in many ways in case of any accident. Air bags can be deployed near the knees of the driver or the passenger. Air Bags are also available for head protection and pelvis protection in case of any side impact. LED Lamps – Visibility of the GT S has been increased with the LED daytime lamps fixed onto it. These lamps glow the moment the car is switched on. LED lights triggered on the application of brakes and gives the driver behind the GT S a few more seconds to react and slow down. These few seconds can actually save an accident from taking place. LED lamps are durable and stylish and have a longer life. Headlamps lighted with LED – The headlights in AMG GT S are powered with full LED lights and the brightness beam generated is appropriate for driving purposes. Brake system – The GT S brake system is powered by brake assist which is smart enough to sense if emergency brakes have been applied. The system can gauge the same basis the pressure applied by the driver on the brake pedal. The brake system is capable of eliminating the delay caused when brakes are not applied as hard as they should have been. This way the distance of the impact can be substantially reduced. 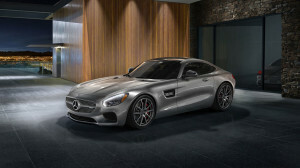 Visit Mercedes-Benz Brampton to experience a level of luxury and safety that only Mercedes-Benz could offer.